No matter what you hear or read about gold and the prospects for substantially higher price levels, the trend is down, exactly opposite of what you know. When you compare what you know, an opinion, with what the market is telling you, the market is a more accurate measure, however counter-intuitive it may be to your opinion, [and THIS is what the markets are saying]. So says Michael Noonan (edgetraderplus.com) in edited excerpts from his original article* entitled Gold And Silver – Calls For Explosive Upside In PMs Misplaced. People who make predictions are blowing smoke in the readers face. All the “predictions” for 2013 should be sufficient proof, yet the pattern has already started to be repeated for 2014. Unfortunately, almost everyone’s focus is misplaced, and the reasons why gold and silver remain at low levels are not being given their proper due. Anyone who reads our commentaries on a regular basis knows that the most reliable source for what the market will do comes from the market itself. The fundamental news has not changed. 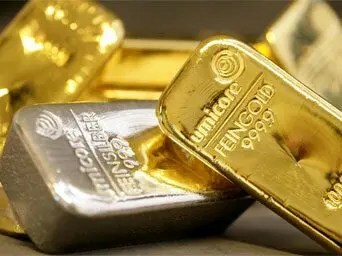 In fact, the shortages for gold and silver increase with each passing month and, with each passing month, the MARKET has been telling a different story, as in the trend remains down. Before gold and silver can rally, they first have to stop going down. It is not that the fundamentals are flawed; facts are facts. The biggest issue has been one of timing, and unless and until you see a huge rally over 1400 in gold and 26 in silver, you are likely to see February and March pass along like January just finished. Not everyone has the ability to properly read a chart but what almost everyone has is common sense, and the markets are replete with logic that makes sense. If you are willing to put aside any predisposition about looking at charts as a waste [of time] or too foreign to understand, then try to follow the logic of what is presented below, and you will have a more realistic understanding of what to expect, moving forward. We have 8 charts, 4 for gold and 4 for silver, below and as you will see they do not appease the need for hearing how gold and silver are going to be X amount higher, sometime soon. However, there was an interesting development in the weekly range just ended. We said sharp increases in volume can be important – and last week was the highest volume since the June 2013 low. There is not a substantial difference in the two volume levels, yet compare the range for last June with the range for last week. Last week was about 1/3 the size of the June bar. Here is where logic come in. If there was almost as much volume last week as last June, but the size of the bar was so much smaller, then we can gain an insight into the character of the market. The same volume effort produced less downside results, and not a wide range lower as occurred in June. This is a red flag. Why was the range smaller? Because buyers were much stronger than sellers and this prevented the range from extending lower. We are getting information from the market that says sellers were unable to push price lower, as they did last June. If buyers can sustain that caliber of effort, it will lead to a rally, and eventually, a change in trend. Changes in trend appear on the smaller time frames first. Price is under the TLs on the monthly and weekly charts. On the daily chart, below, price has broken the TL down and is now moving sideways. The lead month for gold futures is now April, so the previous volume activity was stronger in the February contract, and the volume prior to last week is not reliable, as viewed on the April chart. NUGT is a 3X bullish gold ETF. Let’s take a look at its chart below to see what the market sentiment is in that more leveraged arena. Several months ago, as illustrated below, sentiment had flat-lined but there appears to be some change in sentiment over the recent few months. a) Price: What stood out in price back then was how the market hugged the lows, and held, for December. January turned into the opposite, with price hugging the resistance area. The longer price holds, without backing away lower, the odds favor an upside breakout as buyers are absorbing the sellers. b) Volume: The volume backs up the price activity. During span “A,” while price was in decline, volume was relatively lower than when price subsequently rallied during span “C.” This tells us that demand has been greater as price rallied, a bullish development. During span “B,” volume was at the relative highest, and this tells us smart money was accumulating long positions, in preparation for a mark-up phase. The stage is being prepared for some kind of rally in gold. We do not know how much of a rally, in advance. Instead, we look for signs of buying activity, like the absorption in NUGT. Once price breaks out to the upside, that would be the trigger to be long ETFs and futures. The same market logic prevails in silver as we just saw in gold. As shown in the chart below, the very small range for December was a red flag bar, a warning to sellers that buyers were stronger, evidenced by an inability for sellers to extend price lower in a down trend. This was, and still is, a clear market message as the last bar for January failed to continue lower as it formed a higher high and a higher low. We take the above information to see how it translates on the next lower time frame. By itself, last week’s performance, as seen in the chart below, suggests price should go lower. Clearly, silver has been locked on a TR since mid-November. A question that arises is, why have not sellers been able to push price lower? Activity for the last half of January shows a labored effort by sellers. It is taking twice as long to decline as it took to rally, and that suggests buyers are in greater control down here than sellers. Here’s a look at the daily chart. We do not often show intra-day charts, even though we watch them closely every day but here’s a look at the movement of the price of silver during a 20 minute period last Friday afternoon. establish a position. Smart money buys low and sells high, and it is the public that is always on the other side of the trade. analysis, which is nothing more than a process of applying logic to developing market activity. 2. Noonan on Silver: Wait for Price to Confirm Its Intent – Then Start Stacking! 3. Noonan: The Trend in Gold Remains Down – But For How Long? Previous What Wll Happen In Coming Collapse? How Will Governments Try to Fix Things? This only applies when the market is operating in what I would call “normal situations” and these days we are not in what I would call “normal situations”. Because of the on-going international battle being waged against the continued use of the US$ as the World’s preeminent currency, I believe that the market is now at the mercy of a small group of decision makers which are doing everything they can to WIN, what I refer to as Financial World War I (FWWI). Because of this, I’m suggesting that this is yet another reason to have a percentage of every portfolio invested in physical PM’s, especially since PM’s current values makes buying them painless!